When the Daring Baker’s challenge was announced, I hesitated a little ... I had just recently made 600 sugar cookies for a friend of mine and the thought of making another sugar cookie...well you can imagine...but the truth is – I love to bake...and after all I AM a Daring Baker....so I scooped up the love (I mean one of the loves) of my life, beautiful soft powdery flour, and made more sugar cookies. The theme for the challenge was September. September, for me, means back to school, birthdays for some of my favourite people and fall colours. I love this season and can’t imagine living in a place where the leaves remain green all year long. They are starting to change colours now and very soon they will be vibrant and bursting with colours! Each year we oooh and awwwww at them...we wait for it and then it doesn’t last that long before we get hit with winter. Oh yes, September also means, I am Canadian after all, that Hockey starts – not only the NHL season, but Dan’s hockey as well. He spends a couple of nights a week doing his goalie thing. And therefore I had to make Toronto Maple Leaf Sugar Cookies!!!!! This recipe is very easy but pay attention to the tips! The cookies DID NOT spread at all, so it is a great one to cut out shapes!!!! 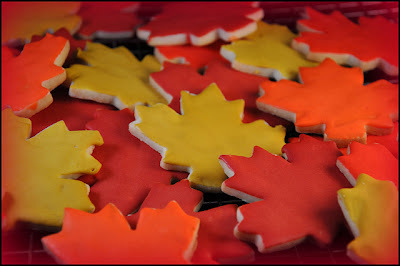 Here is a picture of my other sugar cookies. They were made for tea parties with an "Alice in Wonderland" theme in Blue and Orange colours! Ms. Martin, you make good cookies! 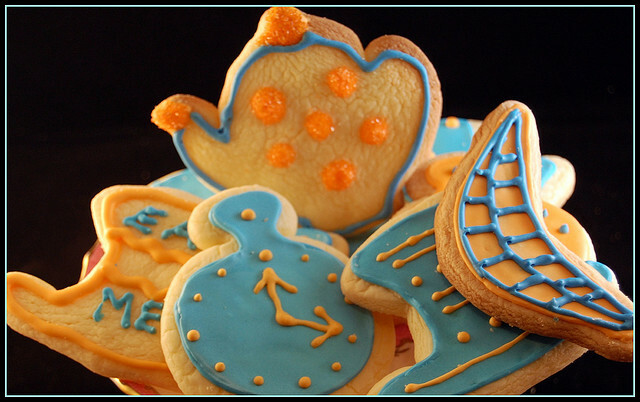 Awesome looking cookies! Especially those Alice in Wonderland ones. Penny! You've got some serious baking action going on ... wow!!! I'm so impressed. 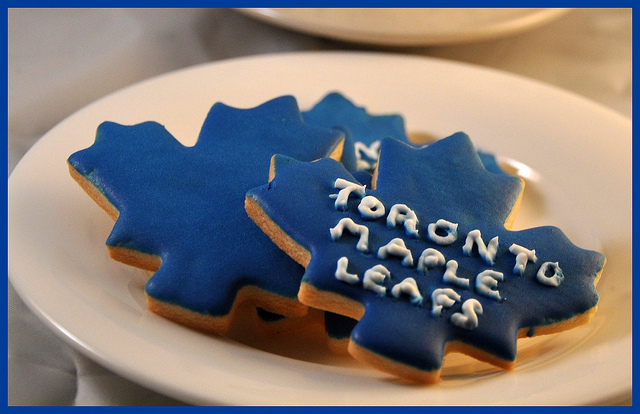 And of course those Toronto Maple Leaf cookies are the most delicious!